As I mentioned in the Storksak Olivia review, I found that the bag was a little small so I couldn’t resist getting the Kate Spade Stevie (which I had seen another Mom carry at a playgroup) when a friend called me to tell me that it was on major sale at the Kate Spade Outlets. I just started using the bag and here are my initial impressions. I love that it is wider than the Storksak Olivia! I can actually put things in the pockets and there is still a roomy center area to put things like an extra outfit and toys. The interior is a beige color which is nice because it isn’t a dark cavern of black fabric making it impossible to look for something. I also love the print that I bought, which is the “Stucco” jacquard fabric. 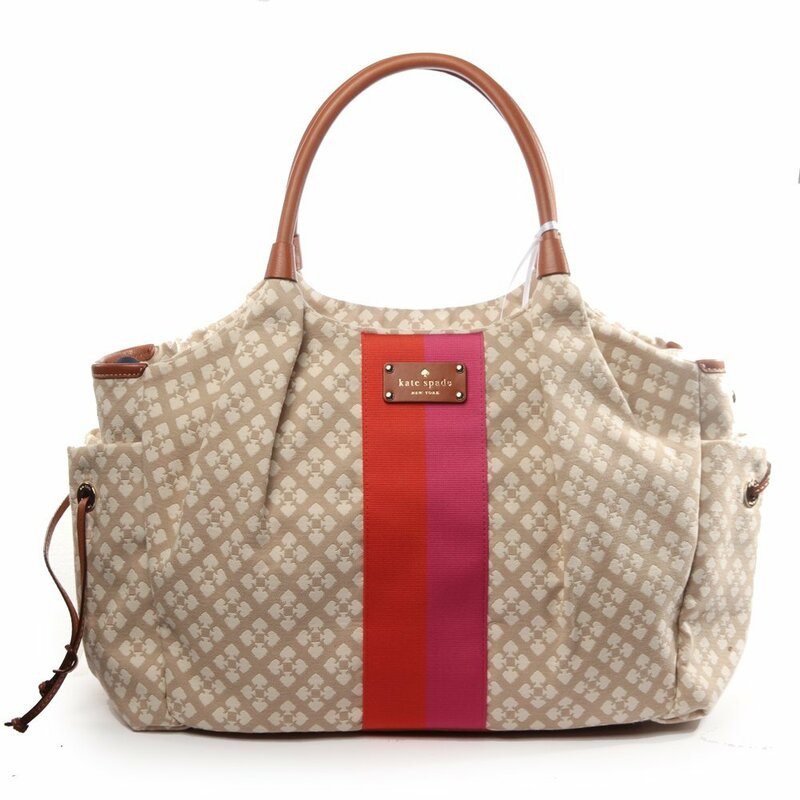 The fabric feels luxurious and I think its a little more fashionable than the Storksak. It definitely looks more like a purse than a diaper bag. It really is a beautiful bag. It also comes in lots of different prints and some are in a nylon fabric that is probably a little easier to clean. The purse also came with a matching change pad which is a tad longer than the Storksak change pad. I don’t love that there are fewer pockets overall. There are 2 gusseted pockets on one side of the bag, 1 elasticized pocket on the opposite side of the bag and 2 bottle pockets on either end. There is also a zippered flat pocket. There are also no pockets with closures on the exterior of the bag — the leather tie down doesn’t get very tight either, so I wouldn’t put anything that might fall out there. It would really have been great if they put a zippered flat pocket on the back side of the bag for easy access to a cell phone. The bag also doesn’t come with a shoulder strap. Instead there are stroller straps. 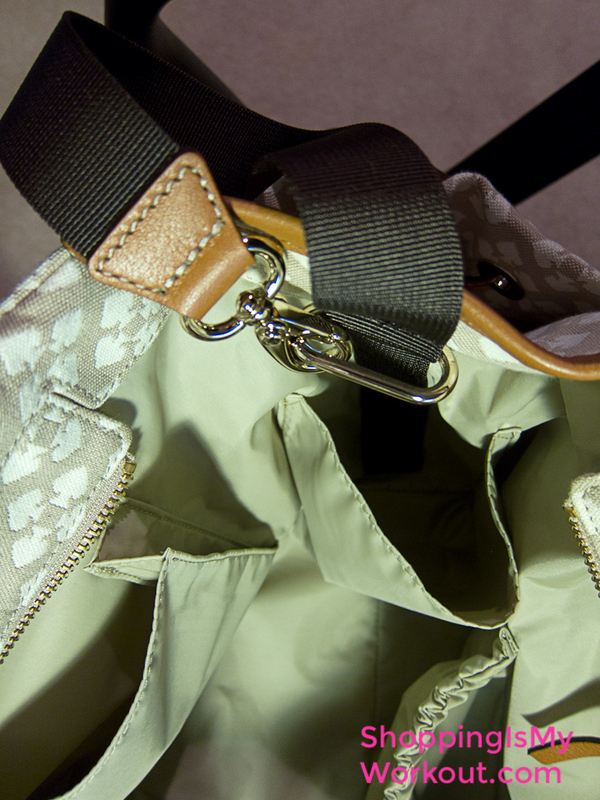 However, you could easily buy a shoulder strap and hook it onto the stroller strap attachment. The retail price is also a big drawback. At the regular price of $348-418 (depending on the print), I feel that it is overpriced. That being said, this bag can occasionally be found on sale for somewhere between $130-250. KateSpade.com occasionally has surprise or sample sales and they have included the Stevie in a variety of prints in the past. I was able to score my bag for around $120 at a local Outlet store which I think is a great price on a quality purse/diaper bag. My needs have definitely changed since the newborn stage so we’ll see if I miss the extra pockets or not. I really, really like the styling of the bag so I’m really happy to give it a try! As a handbag lover, I knew that I wanted to get a cute and functional diaper bag for when the baby came, since all of my new mom friends told me that I probably wouldn’t be carrying a purse for awhile since it would be too cumbersome trying to juggle both a diaper bag and a purse. 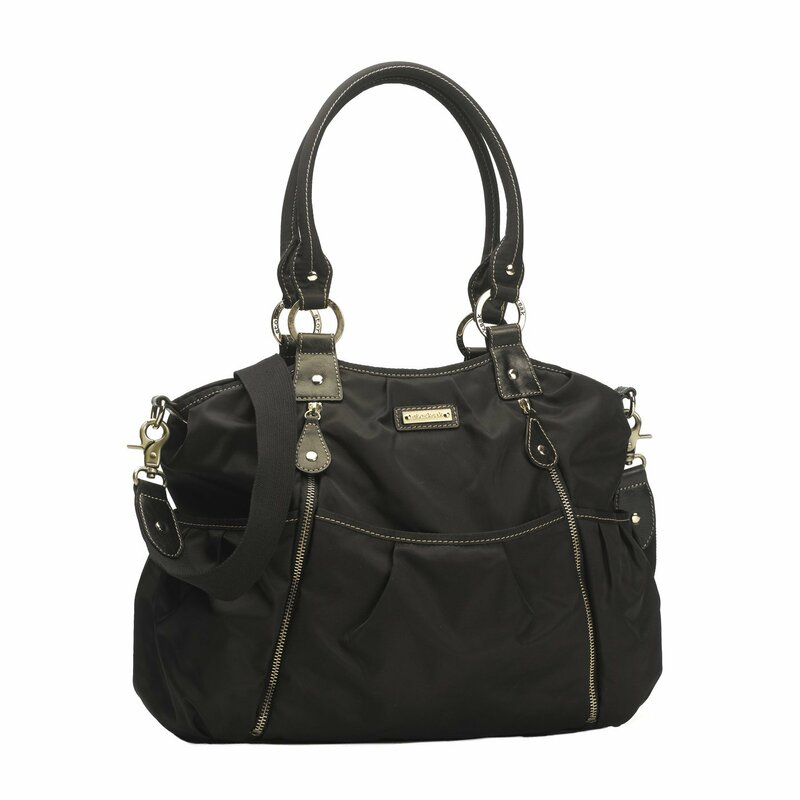 I looked into several diaper bags and I wound up buying the Storksak Olivia from Nordstrom before my little one arrived. The ample inside pockets! On the inside, I love that there are elasticized pockets on both ends of the bag, as well as 2 pockets on each side of the bag. That is 6 elasticized pockets inside which is fantastic. There is also a zippered flat back pocket and it comes with an attached little flat pouch. I store my diapers and wipes on one side of the bag, and on the other, I store fabric items like my nursing cover, bibs and a burpcloth. On the ends, I store hand sanitizer and a pouch of food. On the outside, you can see there is a zippered front pocket (both zippers lead to the same pocket), the front pocket which has a magnetic closure, and 3 more pockets which don’t have any closures. I store my ginormous wallet and trusty Canon Powershot S95 camera in the big zippered pocket, my phone in the magnetic pocket and on the sides I stow my water bottle, sunglasses and a big bottle of sunscreen. I also love that there is both the top handles as well as a long adjustable shoulder strap. This was a lifesaver when I was trying to head out the door with a giant, heavy infant bucket seat as well as my diaper bag. I’d sling the diaper bag across my body and then hoist the bucket seat out the door. The shoulder strap also comes in handy for hanging the bag on my stroller. The first major issue I have is that once all of the interior pockets are full, the bag is FULL! Especially since you also need to put the change mat in the center of the bag. There is almost no space to put an extra outfit — I always end up stuffing it at the bottom of the bag. Any toys that we want to bring end up being stuffed at the top. In the early months, I used a Baby K’tan and it just would not fit in the diaper bag unless I really stuffed everything down. Inevitably, I’d need something at the bottom of the bag and I’d need to pull everything out. It was quite annoying! Also, my phone has fallen out of the magnetic closure pocket on more than one occasion, though its my fault for not putting it in a zippered pocket. I just wish there was a second zippered pocket on the exterior of the bag. 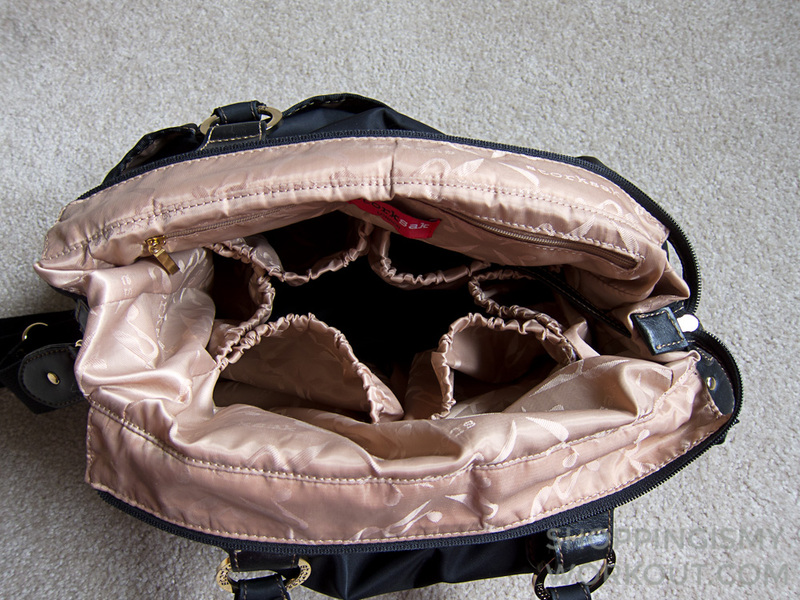 Between my wallet and camera, there is no more space in that big exterior zippered compartment. I do really like this bag and I used it exclusively through my daughter’s first 11 months! 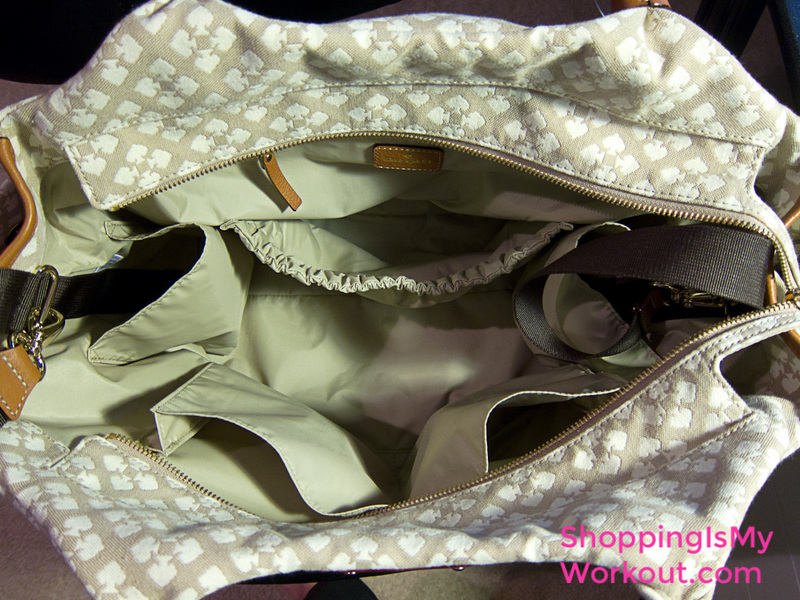 I got lots of compliments on the bag and my husband loved that it had so many pockets for organizing stuff. The adjustable shoulder strap was also a big plus. I just wish it was a tad bit bigger so that when I had filled the interior pockets, there was still room in the center for a few items. The bag seems well made and comes with a change mat, bottle sleeve and a flat zippered pouch. I would recommend this bag to friends. My little girl C is fast approaching her 1st birthday and I really wanted to buy her a special outfit to wear at the birthday party that I am planning. I am thinking that the party will be pink and Paris themed so with that in mind, here are a few options I’m considering. I really like the bold stripes on this but its not available in C’s size, though I bet I might be able to track it down via customer service. I love the vintagey theme of this dress but alas its not available in C’s size! I think this one is really cute but the accents are red rather than pink. It is available in her size though! Daisies weren’t the theme, but this one might work! Did you get a special outfit for your little one’s first birthday? Help me choose which one would work with our Paris theme! Which one would you pick? Hello and welcome! I’m Stephanie and I’m a Seattle girl who is a bit of a shopaholic! I love scoring a great deal on everything from fun things like clothing and makeup to essentials like car insurance and groceries. I am married to a wonderful husband M and I also have a beautiful baby girl C who was born in 2012! I also love sharing my shopping tips with my friends and family so I hope you’ll join me here as I share my best finds as well as posts about fashion and personal finance. And I hope you’ll indulge my occasional posts about food, decor and parenthood!